Choosing which iPhone model to purchase this year should be more carefully considered, as both AT&T and T-Mobile models of the iPhone 7 and iPhone 7 Plus do not support CDMA networks such as Verizon and Sprint in the United States. Apple confirmed the matter in fine print in the iPhone 7 tech specs and on its LTE page. A customer that purchases an iPhone 7 from Apple's website and selects AT&T as their carrier, for example, would be unable to later use the smartphone on Verizon, Sprint, or any other CDMA network, even if the device is unlocked. By comparison, all iPhone 6s and iPhone 6s Plus models worked on both GSM and CDMA networks. A customer that purchases an iPhone 7 from Apple's website and selects Verizon as their carrier, on the other hand, would also be able to use the smartphone on AT&T, T-Mobile, Sprint, or any other GSM or CDMA network. It was previously reported that Apple would switch to Intel modems for select iPhone 7 and iPhone 7 Plus models, including AT&T models, and Intel modems do not support the CDMA standard in the United States. That is likely the reason why AT&T and T-Mobile models are limited to GSM networks. The same report said Qualcomm would supply modems for the remaining iPhone 7 and iPhone 7 Plus units, including Verizon and Chinese models, and this appears to be the case. Qualcomm modems support both the GSM and CDMA standard, which explains why the iPhone 7 from Verizon and Sprint will work on all carriers. Qualcomm, which holds patents for WCDMA and CDMA2000 standards, is the main CDMA modem supplier in the United States. The company developed the first CDMA-based cellular base station in 1990, and since then it has licensed its technology to companies like Apple in return for royalty payments. Until this year, Qualcomm was Apple's exclusive supplier of modems for LTE and Wi-Fi connectivity, which explains why the iPhone 6s and previous generations supported both GSM and CDMA networks regardless of carrier. But with Intel entering the mix, choosing which iPhone to purchase is now more meaningful. The lack of CDMA support in iPhones with Intel modems may be short lived, fortunately, as Intel acquired CDMA assets from VIA Telecom in 2015. It is believed that this acquisition could pave the way for Intel to release its first LTE modem with both GSM and CDMA support as early as 2017 or 2018. Ultimately, the most obvious choice should be to purchase a Verizon or Sprint model, even if you are an AT&T or T-Mobile customer, especially when considering resale value. However, some customers may have difficulty purchasing from another carrier, depending on their current status with their existing carrier. Apple should also release an unlocked SIM-free model in the U.S., likely based on the Verizon/Sprint model, in a few weeks based on past launches. This is such crap. Just release one damn phone for all the carriers and stop going back and forth on it. CDMA should no longer exist. It's literally one of the oldest technologies ever, yet companies like Verizon still use them? So goddamn evil. Well that seems like a step backwards, they should have just not used Intel yet. They need to just release one model that has everything for all regions. No more of this carrier/region specific capabilities or features. Just one phone to rule them all. Will the unlocked phones that Apple sells through the annual upgrade program support both standards? Glad we don't have this "trickery" in Canada - here, one size fits all. Agreed, the obvious choice should be the Verizon or Sprint model so it could be used in any CDMA/GSM network, IF those Verizon or Sprint models are unlocked. Do you know if those come unlocked? i.e. I buy the Verizon or Sprint model and right away in put my T-Mobile chip, will it work? All Verizon phones with LTE are ALWAYS unlocked. It's the safest choice. You may not be able to order online, but go to the Apple Store on launch day and ask for Verizon "Device Only" and you'll get what you want. And yes, it will work straight away just by putting in your T-mobile SIM. 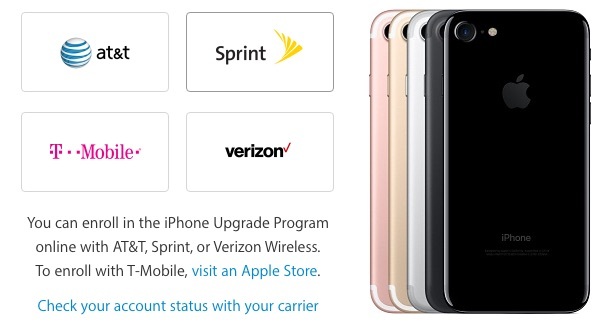 Really, it's asinine that they're still making different iPhone models that each support unique cellular bands. This is 2016, not 2006. You'd think we would be moving toward having one iPhone that works seamlessly across all carriers around the globe by now. They seemed to be moving toward that direction with the 6 and 6s, and now they're going back the other way. CDMA is the reason you have good coverage in rural areas and inside buildings. Old yes, outdated only in Europe! WTF Apple? Thanks, Macrumors! I was curious which phone to get because I'm going to be switching from Verizon to AT&T after I receive this phone. I appreciate the info. For those complaining that CDMA needs to go - where I live, CDMA is the *only* game in town. AT&T promised in 2008 that they were 3 months away from giving my area access to GSM. Nope. 8 years later, and my AT&T iPhones and iPads display "No Service". It's a 15 minute drive to get any GSM signal here in rural NC. Yes, in the "bigger" cities like Asheville, you get GSM and CDMA. But this area is quite large here, and the only company that offers any kind of signal what so ever, is Verizon's CDMA network. And there are holes in their coverage too. Driving to Greenville, SC, there is a 25 minute part of the commute that I have neither Verizon nor AT&T signal. CDMA is not dead yet; even if it should be.